The first step in growing marijuana is of course obtaining seeds. There are multitudes of different types of seeds and strains. Some are better for growing indoors, some are better for outdoors, do some research on what type of seeds are best for the type of grow you are planning on doing. Getting seeds can be relatively easy, give it a quick google and there will be plenty of online vendors that supply them. There are a few things to keep in mind and do for optimum security when ordering seeds online. Check to make sure that the vendor you are obtaining the seeds from ships their packages discretely. If you are going to be paying for the seeds with your personal credit card make sure the vendors state that they destroy payment information immediately after payment has been confirmed. It is however recommended that you go down to your local department store or pharmacy and buy a prepaid visa card to buy the seeds with. If the site asks for an email, don’t use your personal email, create a new email and use that. When creating the new email to use with the purchase (and when actually placing the order on any cannabis seed supply site) make sure to have a proxy running. Downloading and running a proxy/vpn is relatively easy, try this one for example https://openvpn.net/ it’s open source software that will hide your ip address. Download, install, run, and connect to one of the ‘virtual private networks’ listed, if you need more instruction on how to do this there are multitudes of tutorials online. Generally the worst thing that will happen when ordering seeds online, is that they won’t show up. Someone got wise to what you were ordering and grabbed them, or law enforcement found out what was inside the package and confiscate them. However the worst possible scenario that will happen when ordering is the mailman will come to your door and ask you to sign for the package. NEVER sign for any package that has contraband in it, this implies that you knew what you ordered and are implying that you accept responsibility for the package. If someone does try to get you to sign for your package, simply decline and say you didn’t order it, this leaves you with plausible deniability. Also always order using your real name and address. Once you have obtained marijuana seeds there are a variety of items you will need to have to successfully grow cannabis. When you growing marijuana using artificial light you are going to want to waste the least amount possible. Some people use tinfoil but this is not nearly as effective as using Mylar or Foylon. Both of these materials reflect large amounts of light. So when setting up your grow room make sure to put up one of these materials that reflect light over the walls, floors and ceilings. This will optimize the amount of light your plants get, as well as recycle light that wouldn’t be used. It is crucial to use timers when growing bud. Basically you set up a timer so that it is synchronized with your light system. By using a timer you will artificially create a sleep/wake cycle that all plants on earth are used to. There are two different types of light cycles that will do different things to your plants. By growing indoors you dictate what light cycles your plants are on, triggering either the vegetative growth cycle, or the flowering cycle. After the seeds have germinated you want to keep your plants on the vegetative growth cycle until they are about twelve to twenty inches tall. The vegetative growth cycle is generally eighteen hours of light vs six hours of darkness. Once your plants have reached the desired height, change your timer to a steady twelve/twelve hours of light/dark. This will tell your plants that it is time to flower. 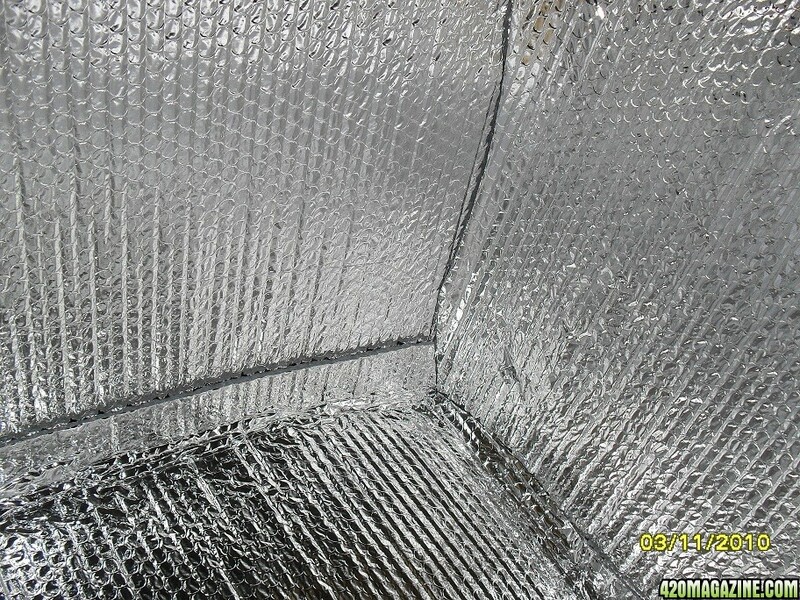 Keeping your grow room ventilated is key to a successful grow. Seeing as how your room is going to be for the most part completely sealed, inside your grow room there is going to be an excess of oxygen. Your plants need other chemicals in the air to survive. Set up exhaust and intake fans to fix this problem. One important step to growing is keeping the area outside your grow room odorless. Make sure to install a carbon filter on your exhaust fan to completely filter out any smells from the air exiting your room. The carbon filter will completely neutralize any smells that would otherwise stink up the area. In addition to an exhaust fan you will have to set up an intake fan that brings new air into your room. This air will naturally have the chemicals needed for your plants to survive. When setting up your fans make sure they are as small as possible, or set up a rig to make sure minimal light enters your grow room. Having light hit your plants even for a couple of minutes during the time when it is supposed to be dark can completely destroy the cycles you have been trying to get your plants to fall into. Another aspect to your grow room that is a necessity is temperature control, an air control unit will need to be installed in your grow room. Make sure it is reliable and can keep your room between 72-76 degrees fahrenheit. Get a hygrometer that will measure the temperature in your grow room to make sure the temp is consistent. Having your plants in a room with unregulated temperature can cause them to either die, produce a very small yield, or no yield at all. Having both high quality soil and fertilizer are very important to a successful grow. These are the things that your plants eat, and live off of (besides water). For soil you are definitely going to want to get the highest quality organic soil you can. Depending on what stores are available to you, top of the line gardening supply stores generally sell higher quality organic soil mixes. But if a store like home depot is your only option just try to get the most expensive organic potting soil blend you can find. Make sure whatever you get has peat moss in it, and if it doesn’t just buy some separately and add it in. You can use different types of fertilizer but it is generally recommend to buy fertilizer that’s specifically for marijuana. These types of fertilizers can be bought on various sites and are perfectly safe and legal to buy. Just apply the fertilizer to your plants soil based on the instructions provided, this is going to be what your plants mainly live off of and will help them to grow faster and give better yields. Having optimal growing containers can be very critical. Depending on what you grow your plants in they can become root locked and potentially die. The minimum size pot is going to be about 12″ deep, or roughly a three gallon container. If you try to use pots smaller than this your plants roots can run out of room to grow, and will ultimately cause the plants harm. Do some research on what the best depth growing pots will be for you. Depending on what size pot you pick, the plants will either grow to be very large, or on the smaller side. Using LED lights are not a requirement for growing marijuana but are extremely superior to using other types of lights. They add an extra layer of security as they are much less noticeable to anyone checking your house via heat sensors, or looking at your electricity bill, as they take far less electricity than normal lights. There are multitudes of LED lights specifically designed for growing marijuana, these lights will optimize your harvests and electricity usage. You can buy and rig up LED lights yourself which is definitely a cheaper option, but it is definitely recommended to buy pre-designed ones. While these are just the essential items needed to grow, there are many miscellaneous items I have not mentioned. Do some more research and read a lot to compile a comprehensive list. Growing is a massive undertaking, in addition to the things I haven’t mentioned there will be unforeseeable tools and items you will need, be prepared to run to the hardware store !